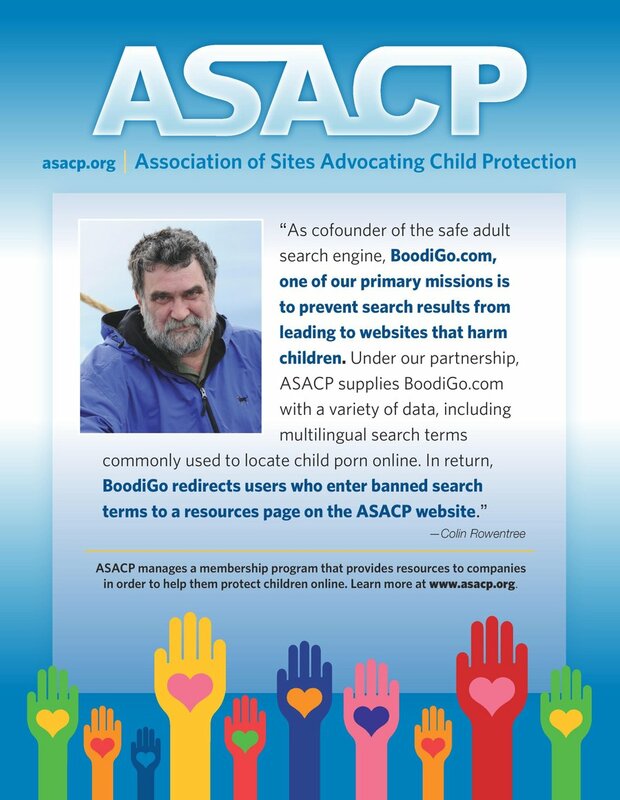 LOS ANGELES (November 1, 2016) — The Association of Sites Advocating Child Protection (ASACP) is delighted to announce its Featured Sponsors for the month of November, 2016. ASACP’s Featured Sponsors serve as excellent examples of companies taking a proactive approach to corporate responsibility, and represent the pinnacle of ethical operation. Continuing its 20-year record of success, ASACP’s internationally recognized Child Exploitation Tipline has processed more than one million CP reports since its inception, while its free educational tools for digital media companies provide market specific Best Practices and a universal Code of Ethics for businesses, app- and website operators. In addition, ASACP’s Restricted To Adults (RTA) meta labeling sytem aids parents by helping prevent children’s access to adult-oriented websites and mobile apps — and is provided to all website and app publishers free of charge — thanks to the generosity of the non-profit association’s sponsors. For November, ASACP recognizes XBIZ, AVN, and Cybersocket, as its Featured Sponsors, in gratitude of their ongoing support of the association and their commitment to protecting at-risk youth online. A founding Platinum Sponsor since 2002, XBIZ has had a long relationship with ASACP, with both organizations founded by adult entrepreneur Alec Helmy. According to XBIZ, it is the adult entertainment industry’s leading publisher of business news and information, providing up-to-the-minute coverage of the industry at XBIZ.com and in three trade publications — XBIZ World for the digital media market, XBIZ Premiere for the retail market and XBIZ Sensuals for the intimate products market. In addition, XBIZ hosts multiple annual events including the red-carpet gala XBIZ Awards. Frequently cited in the media’s coverage of the industry, XBIZ is featured in CNN, Fox News, Newsweek, MSNBC, Forbes, The Wall Street Journal, Wired, CNET, ABC, USA Today and Los Angeles Times among others. A Platinum Sponsor since 2002, the AVN Media Network has a long history of support for ASACP and its mission. According to the company, it is the definitive source for all that is adult entertainment by covering the evolution of this multi-billion dollar global industry — setting the standard for the business of pleasure by delivering unparalleled content reaching industry professionals, mainstream media, and a diverse spectrum of consumer groups and communities. AVN protects children from accessing the adult-oriented material on its websites by utilizing RTA labeling as a proactive and protective measure. AVN has also been very generous to the association financially and through material support, extending its hospitality at AVN events, such as providing advertising services and underwriting hotel accommodations, among other niceties that have helped the association carry on its mission — including providing advice and assistance through its participation on the association’s Advisory Council. An ASACP Corporate Sponsor since 2003, Cybersocket targets the LGBT community by producing the nation’s largest freely distributed gay magazine; as well as the Gay Pornucopia blog; a comprehensive search engine; and the gay webmaster chat board, TheGayBoard.com. The company also hosts the annual Cybersocket Web Awards, honoring the finest gay online services. Cybersocket seeks to popularize gay- and lesbian-oriented websites, while providing news, practical resources and provocative original content for the LGBT community. An industry leader, Cybersocket provides a powerful example of keeping children out of and away from adult oriented material, in part by using the Restricted To Adults (RTA) meta-label on its website. While XBIZ, AVN, and Cybersocket operate on the periphery of adult entertainment, they each share a common goal of protecting children online and in their daily digital lives. To become an ASACP Sponsor today, or for more information on how your company can help protect itself by protecting children, email tim@asacp.org.